Deck the halls with this holiday treat! 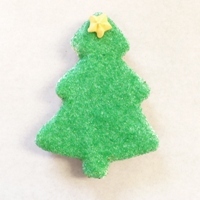 Our brownie Yule tree is strung with a garland of candy tree lights and the festive glitter of green sanding sugar upon white chocolate tinted the shade of evergreens. No need for gifts under this delicious tree! Perfect for caroling parties, teacher gifts, Christmas gifts, holiday festivities, or stocking stuffers. Decoration: Fine white chocolate, green sanding sugar, green food coloring, red candy writer (sugar, palm kernel oil, cocoa, non-fat dry milk, dry whole milk, glyceryl lacto eaters of fatty acid, salt, artificial coloring), candy tree lights (sugar, rice flow, vegetable oil, corn starch, cellulose gum, carrageenan, confectioners glaze, gum arabic, food coloring).